ZX kitchen has taken ceramic cutlery to a new level by developing a line of products that are elegant, strong and easy and safe to use. Made from Zirconium Oxide, one of the hardest materials after a diamond, the ceramic blade is sharper than steel and can achieve superior sharpness for 5-year without the need for sharpening. White ceramic can stain, so ZX kitchen only makes knives using black ceramic blades. They are sleek in design and make a beautiful addition to any kitchen or table. ZX kitchen knives come in a beautifully designed box with magnetic closure, making them the perfect gift. Sheath covers are also available for all zx knives. Unlike steel, ceramic knives are lightweight and easy to handle, so there is less fatigue when cutting is repeated. Ceramic knives are chemically inert and don't deposit metal ions into the food – so no rusting, no discoloration of foods and no metallic taste, all of which can be produced by steel. An added plus is that ceramic is a non-stick surface, making it easy to clean. 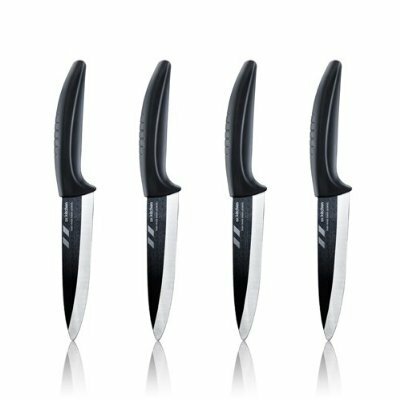 ZX kitchen knives are designed with a comfort grip rather than hard plastic handle so they rest smoothly in your hand. The blade does not protrude out of the handle, so your knuckles are safe while cutting and slicing. By their very nature, ceramic knives need to be handled with care. They are not intended to cut bone or other hard foods. Do not use for carving, prying or scraping. Do not try to sharpen. Avoid extreme heat or shock and keep out of the reach of children unless properly supervised. ZX kitchen knives can be hand-washed or laid flat in a dishwasher. Do not leave at the bottom of the sink or drawer where other items can be piled on top of them. ZX kitchen offers a Lifetime Warranty on all its products and guarantees that its products are free from defect in materials and workmanship. For any questions concerning ZX kitchen products, please email us at info@zxkitchen.com. If you have any questions about this product by ZX Kitchen, contact us by completing and submitting the form below. If you are looking for a specif part number, please include it with your message.